The February S&P/Case-Shiller Home Price Indices are now out. The index shows declines in the prices of existing single family homes across the United States worsened in the second month of the new year, with 17 of the 20 now reporting MSAs posting record low annual declines, 10 of which are in double-digits. The following chart was produced by "TC" who has been monitoring C.A.R. data, DQNews data, and Case-Shiller Data. Although individual cities topped at varying times, the top-10 and top-20 cities peaked in a June-July 2006 timeframe. "TC" writes: I've included data available from the CME Futures market so your viewers can see when people are betting the downturn will end and how much lower it will go. The CME Futures market only trades the top 10 cities. One interesting "transition" since I last checked the Futures quotes (I do so monthly upon the release of the Case-Shiller data) is that West Coast markets are now predicted to decline further than previously forecast, yet bottom sooner. That seems rather odd to me and it may be because the Real Estate Futures Market is so thinly traded that its forecasting ability is limited. Inquiring minds will also want to take a look at commentary from Calculated Risk on Case-Shiller: Year-over-year Price Changes. Calculated Risk discussed the discrepency between Case-Shiller and the OFHEO (Office of Federal Housing Enterprise Oversight) in House Prices: Comparing OFHEO vs. Case-Shiller and House Price Indices. Following is a sip from the first link above. This suggests that one of main differences between OFHEO and Case-Shiller was that Case-Shiller included many non-agency homes financed with subprime loans. These homes saw more appreciation during the boom, and are now seeing larger price declines. 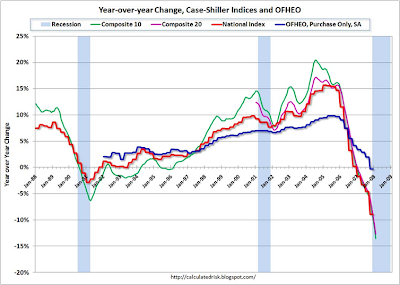 Whatever the reasons, the Case-Shiller index seems to more accurately reflect the current price declines in the housing market, as opposed to the OFHEO index. And this has significant implications for the economy. The Fed uses the OFHEO index to calculate the changes in household real estate assets. If the OFHEO index understated appreciation during the boom that means households have MORE real estate assets, and more equity, than the current Flow of Funds report suggests. That sounds like good news, but ... that also means that during the housing boom, the wealth effect was larger, and the impact on GDP greater, than current estimates. This also means - if OFHEO understated appreciation - that the negative wealth effect, and the drag on GDP, will be probably be greater than expected during the housing bust. Leave it to the government and the Fed to cause the housing bubble, to totally screw up measurement of the housing bubble, and to screw up the measurement of the housing bust as well. It's a perfect track record of incompetence.